According to the calendar it is now spring. This time of the year I begin to glare at the white stuff falling from the sky and declare that it is not snow, instead it is "White dust." I also begin to have trouble cooking locally and in season. My taste buds have declared they will have nothing more to do with apples, and so have my boys. I was talking with a mom friend while our children had a play date the other day and we compared notes on our recent abandon in the grocery store. She bought grapes from Chile and I bought strawberries. In addition my winter CSA is over but the summer one has not yet begun. The stores all try to push the season of spring in the produce aisle by having asparagus on sale. However I have stayed away from the woody looking asparagus from across the country. Come May and June we will eat so much asparagus that we will get tired of it, so I can wait. However I still want a light flavorful spring vegetable. 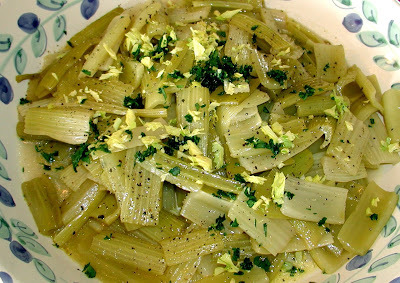 One that is easy to prepare, tastes like spring and can be served as a side dish at Passover and Easter. 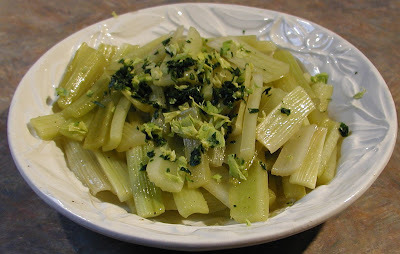 When planning this years Passover menu I discovered a recipe for sweet and sour celery. In all honesty I probably would have ignored it if Ruth Reichl had not mentioned it in her letter from the editor. I like a reason to try a new recipe and her description of visiting the test kitchen to steal pieces of the celery and its flavor sold me. The recipe is really very simple, there are only 6 ingredients if you don't count pepper and salt, 5 if you don't count water either. However the slow gentle cooking mellows the celery, making it tender while the honey and lemon make it brightly flavored and comforting. I loved it so much for Passover I made it again 3 nights later when we were invited over to a friends for Easter. Sebastian had 3 helpings on Passover, along with his weight in brisket and several helpings on Easter. 4 pounds celery (from 2 - 3 bunches) outer ribs that are tough and darker green peeled, cut in to 2 inch lengths and then in half lengthwise if wide. Trace the lid of a wide heavy pot that is 6 to 8 quarts on parchment paper. Cut out the parchment round and set aside. I used my 7 1/4 qt round Le Creuset Dutch Oven on Easter and my aunts 6 3/4 qt oval french oven on Passover. Combine water, lemon juice, olive oil, honey, salt, and pepper in pan and heat over medium heat, stirring occasionally until the honey is dissolved. Add the celery and stir so it is all coated with the braising liquid. wet the parchment paper, crumple it up, open it and then place on top of the celery. Cook over medium low heat just below a simmer until the celery is tender, 30 - 45 minutes. Remove the celery to a serving bowl and continue to cook the liquid over medium high heat until it reduces to approximately 3/4 of a cup. Pour reduced liquid over the celery and sprinkle the parsley and celery leaves on. Serve hot or at room temperature. On Passover I cooked the celery for 45 minutes, on Easter I was running late so I cooked it for 30 minutes. It was wonderful both ways. I love celery and use it a lot. My fridge is never without celery. But I never think of it as the "star". What a great idea. Thanks for sharing this recipe. Adding it my to try list.